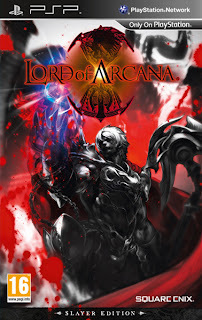 Lord Of Arcana is an Action Game Developed by Access Games, Released in 2011. Some gamers might have heard of a franchise that has exploded across Japan know as Monster Hunter Portable, a game with popularity that rivals the monolithic Pokemon and is most likely to blame for the PSP being Japan's best-selling console of 2010. Lord of Arcana is not Monster Hunter. Though, it does try to be Monster Hunter – a lot. From the layout of the HUD to the fundamental mechanics behind missions and battle, Lord of Arcana attempts to be as close of a clone to Monster Hunter as possible. Unfortunately, Monster Hunter’s lightning-in-a-bottle has not been successfully emulated in this bland, laborious game. Lord of Arcana starts with a brief and lazy story setup of an ancient power awaiting to be unlocked by you, the “Chosen One.” On your way to ultimate power you must traverse the colorless landscapes to collect materials, craft weapons and armor, and slowly conquer the eight Arcana: large monsters that personify magical power. The entire game comes off as bare-bones and uninspired. The village you conduct your business in, your only bastion from the mundane and sparse fields of monsters, is a very small, outdoor space made only with enough room for the five different vendors you will deal with throughout the game. Besides one of the boundaries for the courtyard of vendors being a small empty beach and a few characters that are scattered about to provide meaningless small talk, the village is utterly featureless. As negative as we might sound about Arcana's problems, it wouldn't be fair to not say that there is a niche of gamers that could enjoy this game. However, it should only be considered for veterans of the genre that simply can't wait for the next Monster Hunter Portable iteration to come to the West. For the rest of the curious gamers fascinated by the fantastic phenomenon: stick with the original trend setter. Lord of Arcana has made a painfully deliberate attempt at riding the wave that Monster Hunter started, and lamentably, it's wiped out.